Diwali, the festival of lights, is about joy and celebration. But it is also the time when doctors see a maximum number of eye injuries occurring due to firecrackers. 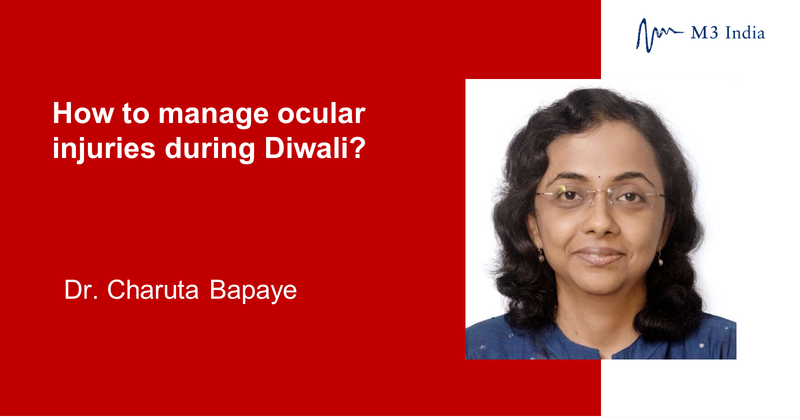 Here we have Dr. Charuta Bapaye, a renowned Ophthalmologist sharing insights on managing eye injuries, common during the festival season. As part of our Diwali series this year, we are covering the treatment and management protocols for common injuries that can occur during the festive season. First in line is ocular trauma, one of the most under-recognized causes of preventable blindness worldwide and 90% of these cases occur in developing countries. Fire-crackers can cause damage by blunt force, penetrating force, foreign bodies entering the eye or thermal and chemical injury. Most often than not, the first help an injured patient seeks is that of the general practitioner or family doctor and not of the ophthalmic specialist. So the onus lies on the family doctor to manage the trauma decorously at his level and refer to the ophthalmologist for further management. Here is a quick guide for the attending doctors and/or the general practitioners. Examine the eye with a torchlight as far as possible. If there are signs of an open globe injury do not force the eye open for examination. That will cause more harm than benefit. Do not put any eye drops or eye ointment if you are not sure of the integrity of the eyeball. Patch the eye with a sterile eye pad without applying pressure. Start a broad spectrum oral or IV antibiotic, preferably a cephalosporin or amoxicillin- clavulanic acid combination. Give oral painkillers if required. Give a booster dose of Tetanus toxoid vaccination if the patient has not received it in recent years. Even if the corneal tear appears small do not attempt to suture it with usual skin sutures. That will cause severe foreign body sensation and corneal scarring and wipe out all chances of visual recovery in the patient. Corneal tears need suturing with 10-0 monofilament nylon under a microscope, while sclera tears require 8-0 nylon or 6-0 vicryl. Lid tears also require proper apposition under a microscope and may have associated lacrimal pathway injuries, so should not be sutured like other routine skin lacerations. Do not attempt to remove any foreign body embedded in the cornea. These need to be removed under strict aseptic precautions under a microscope. Attempting to remove in unsterile conditions or without proper visualisation can lead to corneal infections and perforations, which severely compromise the visual outcome. If the eye ball is intact and injury is due to chemicals, wash the eye with copious sterile water or if not available, drinking water. Explain the gravity of the situation to the patient and refer the patient immediately to an ophthalmologist who routinely practises trauma repair. Not all ophthalmologists do. We many times see patients coming late to the ophthalmologist as they do not understand the seriousness of the situation. Instruct the patient to be “nil by mouth” till he is examined by the ophthalmologist and the need for surgical intervention is decided as he may require a general anaesthesia. If the patient is traveling a long distance to see the ophthalmologist, counsel the patient that he may need emergency surgery, so he should travel with a responsible attendant and with some basic finances. These precautions can avoid delay in the surgical repair if it is required. Half the battle is won if these things are followed by the general practitioner. We, as ophthalmologists, focus a lot on cataract camps, glaucoma week, diabetic retinopathy awareness and eye donation, but nobody pays any heed to social awareness regarding trauma related blindness. It is worth pondering over that ocular trauma mainly occurs in the young population, children and active adults, who are the present and future pillars of the society. Ocular trauma, if properly managed at the primary, secondary and tertiary level, the resulting blindness is preventable to a large extent. Together the family doctor and the ophthalmologist can work as a team to treat ocular trauma efficiently and prevent the resulting blindness. This article was originally published on October 17. 2017.